Ha Nam (VNA) - The northern province of Ha Nam has targeted a 15.3 percent increase in industrial production, valued at more than 48.5 trillion VND (2.2 billion USD) this year. 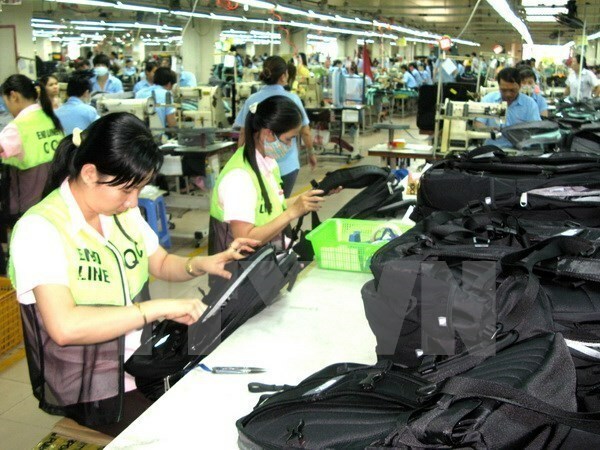 During a conference convened by the provincial Department of Industry and Trade on January 11, the province also set the goal of achieving 16.5 trillion VND (750 million USD) from selling goods and services, and 1.25 million USD from exports, a 19.6 increase from 2015. Dinh Van Duong, Deputy Director of the provincial department, said the sector has worked closely with departments and localities to develop handicrafts, improve the management of industrial parks and clear obstacles to boost exports - particularly in traditional and promising markets. Trade promotion activities will continue, including spreading the campaign: “Vietnamese prioritise Vietnamese goods” and the programme: “Bringing Vietnamese goods to rural areas”. Speaking at the event, Vice Chairman of the provincial People’s Committee Pham Sy Loi called for improving the investment climate, and cracking down on counterfeits, poor-quality goods and food hygiene violations. Last year, Ha Nam recorded a combined industrial production worth 42 trillion VND (1.9 billion USD) plus, marking a 22.8 percent rise year-on-year.